As I sit here typing up this review, my boys and are are counting down the days to the premier of Monsters University on Friday, June 21st. We are big Monsters fans in this house – my boys love the Monsters Inc. movie and both are very much looking forward to the sequel. To further enhance our Monsters mood, we received an assortment of Monster University toys for review. My boys went crazy when they saw all the Monsters goodies waiting for them. My oldest was particularly excited for the Roll-A-Scare Playset. This playset pits two Roll-A-Scare monster racers against each other and when the winner crosses the finish line, their spring-action pops them open in victory! Both my boys love the simple action of this playset. I like that it was easy enough for my two-year-old to understand and to play along with his big brother. The set came with Roll-A-Scare Monster Sully, claimed by my oldest before we even opened the box. My little guy was happy with the Roll-A-Scare Monster Art that’s sold separately – and the great thing is you can play with Art and his pals on their own without the playset, they come with college ID cards that when rolled over cause the monster to pop up just like in the game. The Scare Pals are adorable and fun. My oldest loves Sully and gets a kick out of the noises this Scare Pal makes when you squeeze its belly. The roars and the laughs that come from Sully get both my boys giggling. Scare Pal Mike is pretty humorous, spouting off his typical corny one-liners when you pull on his arms and legs. 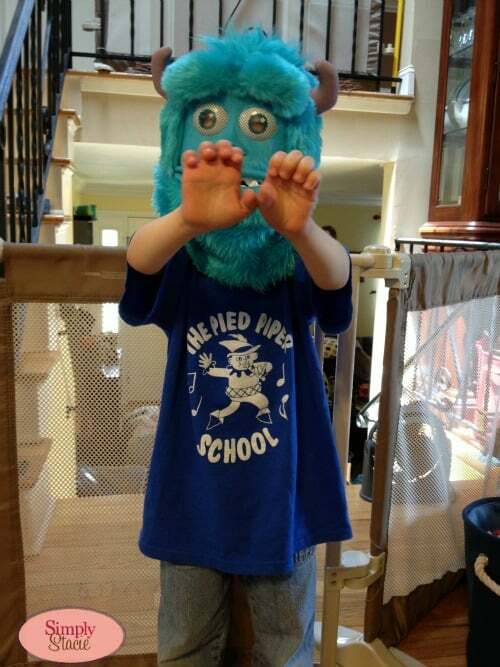 My oldest is also a big fan of the Sully Monster Mask – he’s already asked if he can use it to be Sully for Halloween. This mask has some pretty neat features – allowing the wearer to control the facial movements of the mask with their own movements. These Monsters University toys can be found at all major retailers. 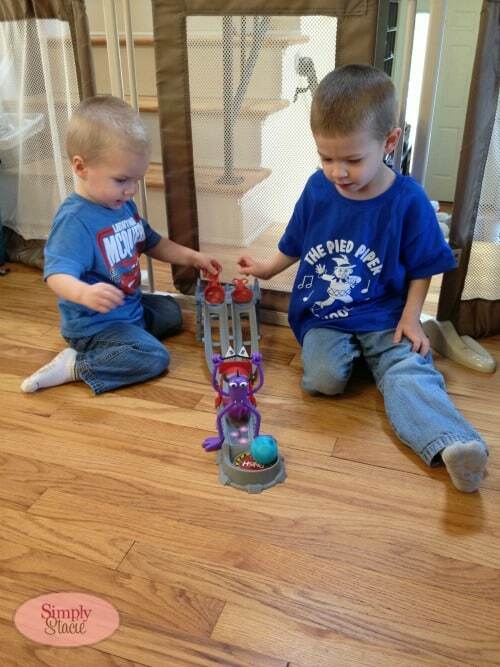 On Twitter, follow all the toy fun with Spin Master Toys and Disney Living. And you can catch Monsters University in theaters. The New Monster’s toys are so cute and look like fun to play with. My nephew would have a blast playing with these. I will have to take a look at the cute stuffed animal for his birthday. My grandkids would absolutely go nuts for these toys! Thanks so much for sharing! 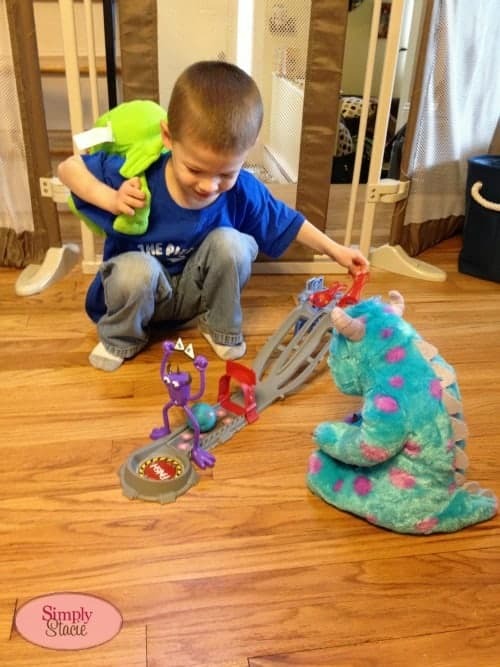 My kids will go nuts for these new monsters Inc. toys! That’s awesome and looks like they had a lot of fun with the toys! My son loves Monsters Inc and we are going to go see the sequel soon too! 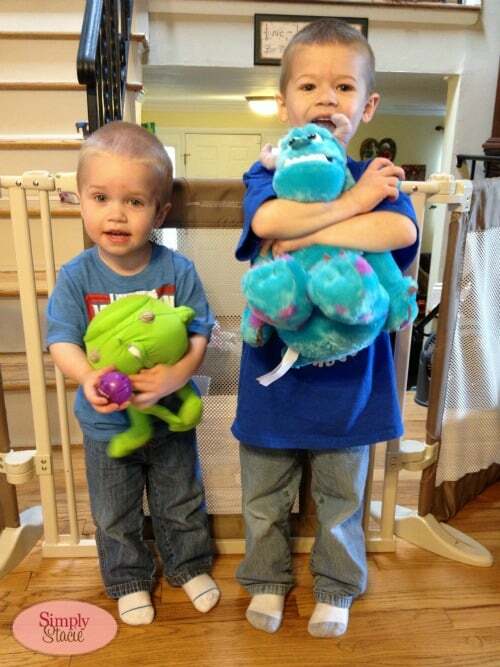 My sons have been carrying around their stuffed Sully and Mike for weeks now. These toys are cute and gentle and very fun! The toys are getting me excited for the movie!!!! Not so sure I am thrilled with the Roll-A-Scare (small pieces?) but I love the Mike stuffed toy. Wouldn’t mind one for myself! Good Morning Gina, My 4 yr old grandson would really like these toys as you have described them. Thank you for giving me birthday/Christmas gift ideas! Vicki. Love all of these but that mask sounds really cool! Great review. All of the toys/items sent to you looked great. I liked hearing about the stuffed animals and the sounds, talking, growling they did and about pulling arms and legs for sounds which does not seem typical of stuffed toys just usually pushing belly or touching/pressing hand. my daughter is obsessed with monsters! 🙂 she would love this.. 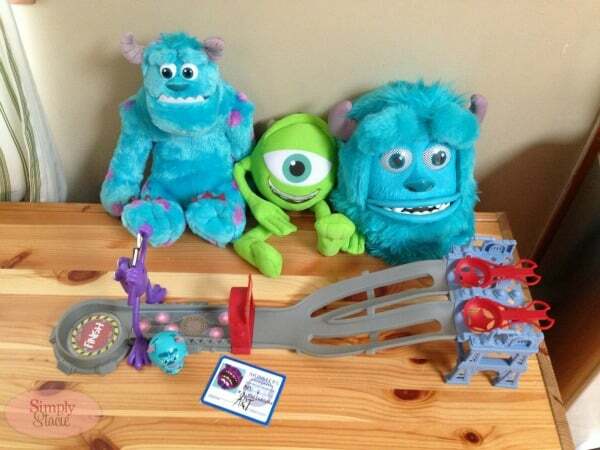 They are so cute, especially Sully. That mask is adorable, and the race set would be perfect for family fun. Adults and children can both get into Monsters Inc. I can’t wait for Monsters University to come out on DVD. That Sully Monster Mask is the coolest thing ever! I wonder if they’ll make an adult-sized one for Halloween. Wish thay had made it to go with the first movie!